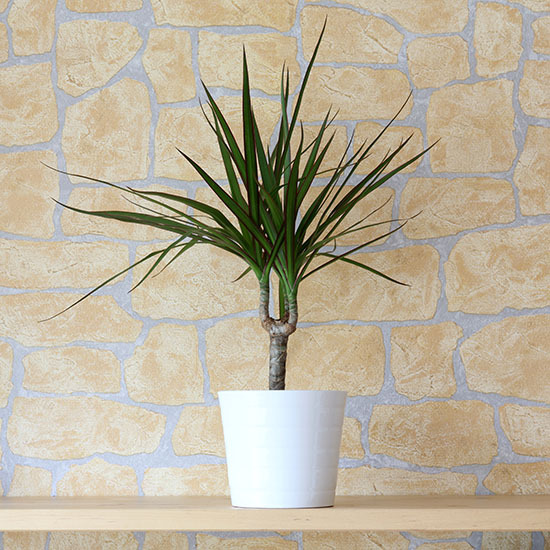 The Madagascar Dragon Tree remains one of the easiest houseplants to look after, which has long been reflected in its popularity in both homes and offices. Along with being very easy to care for, this plant is also very inexpensive to buy, looks attractive, and rates highly on the NASA list of houseplants that absorb toxins from the air, thereby making the air in your home a better quality (NASA Clean AIr Study- Interior Landscape Plants for Indoor Air Pollution Abatement). Overwatering is the cause of most problems with this plant. 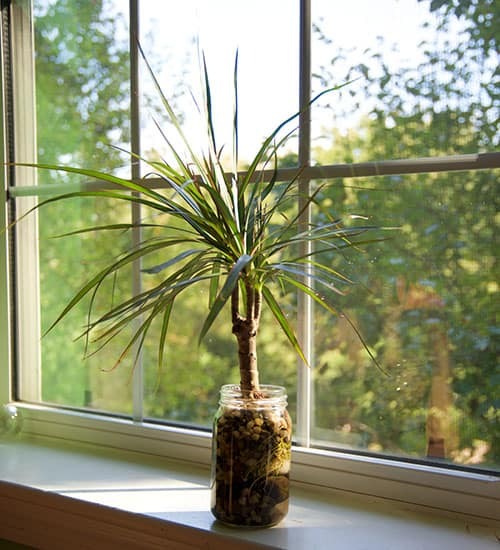 To maintain the best health, only water your Madagascar Dragon Tree when the top inch of the soil is dry. You can test this by simply dipping your finger into the soil. When you do water the plant, give it a thorough watering and then, tip out any water that has collected in the drip tray. This plant does not like to sit in wet soil, and it can lead to root rot, among other problems. If you're underconfident with your level of watering, err on the side of caution. Depriving this plant of water will cause much less harm than giving it too much water. In winter, when the plant's growth becomes much slower, it will need even less watering. You will find that often the plant can happily go three weeks at a time between waterings. This makes it an especially good plant for people who are forgetful when it comes to caring for their plant, or people who are busy, or who travel often. If you are going away on vacation, there's usually no need to organize somebody to come over and water your Madagascar Dragon Tree, as it will survive just fine without water while you're gone. If you live in an area that has a high fluoride content in the tap water, then you may wish to water your Madagascar Dragon Tree with distilled water, as it is particularly sensitive to fluoride. Fluoride in the plant's water can lead to yellowing foliage or other discoloration of leaves (University of Vermont- Department of Plant and Soil Science). Alternatively, you could collect rainwater in containers outside to water your plant with. This is an economical and eco-friendly method of plant watering, though obviously can only be utilized during rainy seasons. Moderate indirect light is best for the Madagascar Dragon Tree. It will enjoy living in some shade, as long as it isn't too dark. If the plant doesn't get enough light, then newly grown leaves will be smaller and sickly looking. The opposite, too much light, is equally problematic, with direct light scorching the leaves (Missouri Botanical Garden). Keep the plant away from any windows that receive a lot of sunlight, or if you must keep the plant on a windowsill, then filter the light with blinds or thin panels of fabric. The Madagascar Dragon Tree likes similar temperatures to humans, meaning if you're comfortable in your home, then your plant will be too. 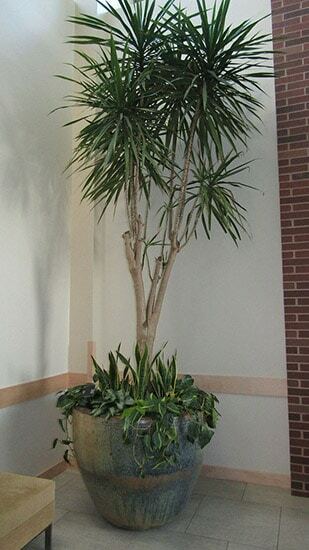 The ideal temperature range for this plant is 16-24° C / 60-75° F, though it can just about tolerate temperatures as low as 50° F. Anything below 50°F will result in a very unhealthy plant, so if you have put your Dragon Tree outside for the summer, then it must be brought back inside before temperatures drop too low. Due to this plant enjoying the warmth, it's best to home it in a room you commonly spend time in. If you place it in a rarely used rec room or guest bedroom that doesn't often have the heat turned on, then it may get too chilly in the winter and start to lose leaves. Similarly, if you live in s colder climate and go away for any length of time during the winter, then you'll need to set the heating on a timer so that your plant doesn't die of cold while you're gone. The fact that the Madagascar Dragon Tree enjoys a similar temperature to people is another element that makes it a good houseplant, as little thought needs to go into keeping the plant well. The average humidity found in homes is suitable for this plant, though particularly dry air might be an issue. To combat this, mist the plant occasionally with a fine water spray. This will help to increase the humidity around the plant, and it also helps to reduce the buildup of dust that can sometimes affect the leaves. As well as looking unappealing, the dust buildup is a common problem for this type of plant, as the dust layer prevents light from getting to the leaves, effectively putting the plant into a heavy shade. The Madagascar Dragon Tree will do just fine without any feeding, especially for a while after you first bring it home because the soil will have plenty of nutrients in it to keep the plant going. If you insist on feeding it, then choose a slow release fertilizer and dilute it to a half or quarter of the recommended strength. This plant is quite sensitive when it comes to feeding, so getting the strength wrong could lead to fertilizer burn. Once the plant is mature, you need only feed it once or twice during spring and summer, again at half the recommended dosage. In autumn and winter, it won't need to be fed at all. The occasional fertilizer feed will encourage lots of bushy new growth, though the plant will survive without any feeding at all. When you re-pot the plant, it will get a nutrient boost from the new soil it is planted in, or, alternatively, you can change the topsoil annually to refresh it and introduce fresh nutrients. This plant will grow in accordance with the size of its pot, so re-pot this plant with caution if you do not want a tall tree taking over your living room. With many houseplants, re-potting is essential for the health of the plant, as it will start to show symptoms of becoming unwell when the roots become pot-bound. This is not so much the case for the Madagascar Dragon Tree, and it will do quite well in a pot that has become saturated with root growth. Younger Dragon Trees will need re-potting every two or years while they are growing, though never go more than one or two sizes up in one move. Once the plant has reached a height you are happy with, discontinue your re-potting schedule, and instead, just change the soil annually. This will both freshen up the nutrients in the pot, and also prevent the soil from becoming too compacted over time, which can create a drainage issue. Madagascar Dragon Trees do quite well with little space for their roots, so re-potting is rarely a pressing issue for this plant. The only reason you may need to repot an older plant, in spite of not wanting it to gain any more height, is if it starts to suffer as a consequence of being in a small pot. Pruning of this plant isn't essential, as it is slow growing and tends not to get messy or out of control. The only exception to this is if the plant gets too tall and you want to cut it back. You can cut the main stems as far back as you wish to shorten the height of the plant, and while it may look a little less attractive for a while, the cut end will start to show new growth in a month or two. Usually, when you cut back one of the main stems, it will then sprout two new stems from that same spot. If you want to create a bushier, less leggy-looking plant, you can use this information to manipulate the plant into growing a little further outward instead of only upward. Trim back your main stems at whichever point you would like them to branch out, and enjoy a fuller, leafier plant. There are several different ways to propagate a Madagascar Dragon Tree, all of which usually have good levels of success. To propagate with a stem cutting, cut the crown and a few inches of stem from the top of your mature plant, and plant this up in fresh soil. Rooting hormone can be used on the base of the stem cutting to encourage root growth, though this is not usually necessary, and propagation of this plant is generally successful without rooting hormone. Your planter cutting will need to be heated from underneath. If this isn't possible, be sure to only attempt propagation during warm summer months when the cutting will naturally benefit from heat. After you have cut off the top of a stem from the mother plant, at least two new stems, though often several, will grow from the cut end. At this point, you can decide whether you'd like to allow them to continue growing on your plant, or if you want to propagate more to make several Madagascar Dragon Trees. To propagate these new stems, cut them off at their base once they are a few inches long, and simply pot them into soil. Keep the soil moist but be sure not to overwater. As an alternative to soil, you could also propagate the cuttings in water, which is a good way to keep track of new root growth visually. This cultivar of the Madagascar Dragon Tree stands out with its longer and wider leaves, which are a glossy green with dark purple edges. The foliage of this plant sticks out in all directions, making the shape of a ball, which is distinctly different from the ordinary Dragon Tree. The leaves of the Tarzan are also tougher than in other cultivars, having a sturdier quality. The plant requires very similar care to the ordinary Dragon Tree, though it is even more tolerant of shade than its relatives. The Dracaena Tarzan is not only able to survive in shaded conditions, but it can even grow while in the shade. This cultivar has seen increasing popularity among plant lovers since its discovery in Florida in 1998, though it tends to be more expensive than other Dracaena cultivars and is usually only available from specialist retailers. Like the ordinary Dragon Tree, it is very easy to care for, with an attractive tropical appearance. It is both pest-resistant and drought-resistant, thriving inside or outside in most conditions. 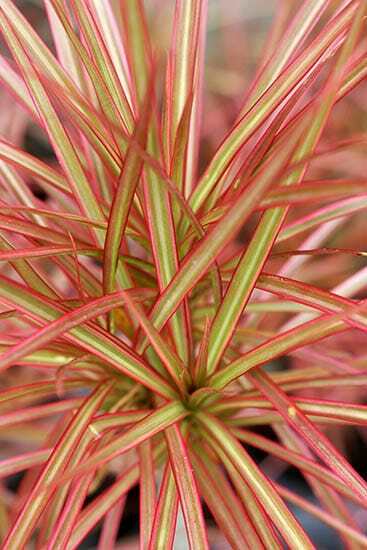 This cultivar is the same as the original Madagascar Dragon Tree, though with a yellow or white stripe down the center of each green leaf, and the usual red border stripes along the external edges. From a distance, the yellow stripes next to the green give it a golden appearance. Aside from the added yellow stripe, this cultivar is very similar in terms of appearance to the original Dragon Tree. The conditions and care that it requires are also similar, though the plant will need brighter light than the original Dragon Tree. 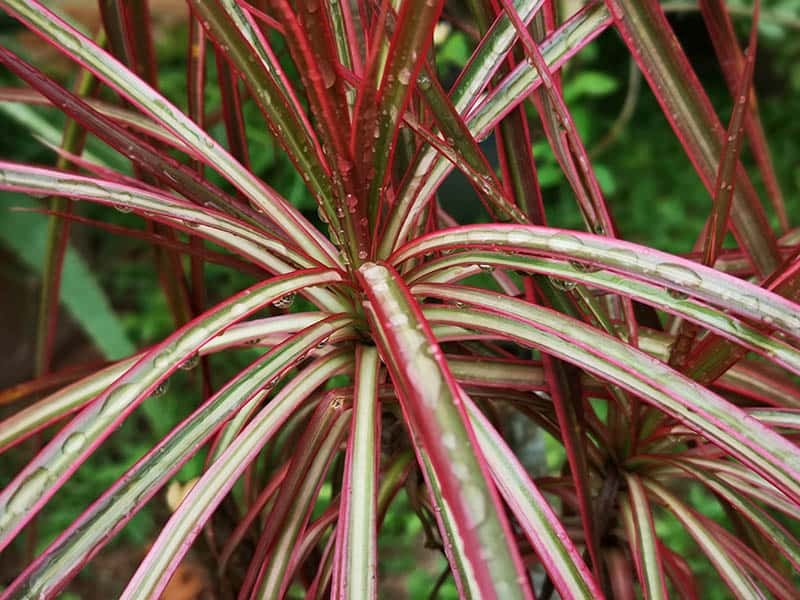 This cultivar features the same colors on its leaves as the tricolor, with the difference being that the reddish pink stripe on the edges of the leaves is thicker and more pronounced, giving the plant an overall more pink appearance. It grows almost identically to the original Madagascar Dragon Tree, the only difference being that it grows slightly slower. The high percentage of the leaves that feature color means that the foliage has less chlorophyll than the original Dragon Tree. This results in the plant needing more light to remain healthy and keep its colors looking vibrant. Do not keep this plant in a shaded area as you would an ordinary Dragon Tree; instead, sit it in an area of bright but indirect light. If the new growth on your Madagascar Dragon Tree comes in the form of small leaves, the problem is almost certainly too little light. Moving the plant to a brighter spot, though still away from direct light, should fix the issue. It can be quite alarming when your plant starts to lose its leaves, but as long as they are dropping from the underneath over the space of a few weeks, then it isn't a cause for concern. New leaves grow from the crown at the top of each stem, and older leaves on the underneath fall off to make space for new growth. If your plant is still growing new leaves at the top, then falling leaves at the bottom are a perfectly normal part of the plant's cycle. They often turn a yellow color before they fall, and again, this is normal, provided it is only happening to the underneath leaves as new growth happens above. A squishy stem is usually the result of prolonged overwatering, or in some instances can also be caused by very low temperatures. A squishy stem can rarely be saved as the damage inflicted on the plant runs too deep. However, if there are any firm spots on the stem, or if the crown still feels firm, then you can cut these parts and propagate them to grow a new plant from the remains of the old one. Brown spots on leaves are a symptom of the plant not getting enough water. It's important to distinguish whether the brown marks are spots or blotches, because blotchy looking brown marks are caused by the opposite problem: overwatering. Identifying your issue and remedying it with either more or less water should resolve the problem. The tips of the leaves turn brown usually as a result of cold draughts getting to the plant. Another symptom of this can be the edges of the leaves turning yellow and thin. Remove any damaged parts of leaves and relocate the plant to a more appropriate place, away from windows or doors where cold draughts can occur. The plant should recover well when in better conditions. Pale or bleached leaves are the result of too much light. Direct light will scorch the leaves and lead to discoloration. Keep the plant in a bright spot away from indirect light, or, alternatively, in a spot with some occasional shade. 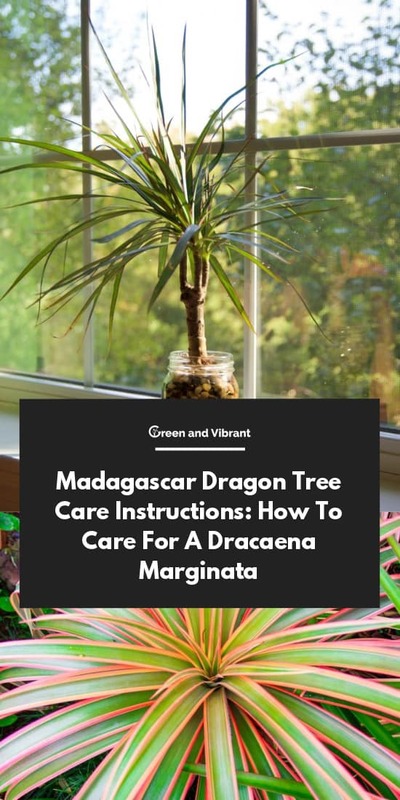 We hope this growing guide helps you to care for your Madagascar Dragon Tree. If you have any further questions or tips you’d like to share, please leave a comment. And if you know anyone with a Madagascar Dragon Tree, don’t forget to send this article!